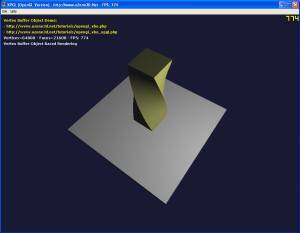 Vertex buffer object (VBO) is a new�method used to describe geometric primitives. It had been introduced by NV_vertex_array_range and ATI_vertex_array_object extensions promoted to ARB_vertex_buffer_object and finally integrated into the OpenGL 1.5 specification. VBO should be the only way to describe geometric primitives with OpenGL LM. 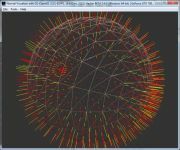 OpenGL LM is the ARB project about simplification of OpenGL API in order to ease graphics card drivers optimisations. Its goal is to compete with Direct Graphics in the field of video games and it should be based on OpenGL 3.0 specifications. ARB aims to simplify OpenGL API which was expected by many developers for OpenGL 2.0. As a result, some features should disappear, such as immediate mode, vertex arrays and specific cases like glRect as well . VBOs are supported by hardware featuring OpenGL 1.5 or the ARB_vertex_buffer_object extension, which is the case for the nVidia TNT series and the first ATI Radeon video controllers. However, all features aren�t always available and even some of them are not even supported by any of the actual graphic controllers. Features, efficiency and longevity are three reasons to use VBOs as soon as possible. Page generated in 0.0030810832977295 seconds.